March was a busy month, what with Easter holidays and a road trip we took to Edmonton, and I never seem to read as much when we have company or are on the road. I still managed to get in 5 books last month though, and I owe it to getting in an audiobook and having a book at hand on my phone. For some reason, I can read a book on my phone and not get carsick, although I still have to take periodic breaks. I don't own an e-reader, but I wonder if I would be able to read books on one and avoid motion-sickness? Anyway, as usual, a bit of a mishmash of genres again, but that's nothing new. What can I say, many different genres speak to me! THE KITCHEN HOUSE by Kathleen Grissom: I read this in preparation for Glory Over Everything (which I reviewed here), although the later could be read as a standalone. I absolutely loved The Kitchen House and found myself staying up much later than my already late bedtime to read it. It's the story of a white servant girl, Lavinia, and how she goes from a young girl living and working in the kitchen house, to a young woman living in the big house and the choices she makes along the way. Although her loyalties lie with her adoptive (slave) family, there are still rules that have to be obeyed and a master to answer to. It's a gripping read, and graphic at times, but it's a story worth making room for on your TBR. THE BEST LAID PLANS by Terry Fallis: Terry Fallis is a Canadian author and this book is a satire on Canadian politics. Reading about politics isn't really my thing so I clearly wasn't the right audience for this particular book. I found the humour to be cheesy and overdone and the plot lacking. I was bored at the best of times and I probably wouldn't have ever found the desire to finish this book if it hadn't been a book club pick. LOVE, ROSIE by Cecelia Ahern: (originally published as Where Rainbows End). This book, told entirely in epistolary format was charming and sweet, but utterly frustrating at times. Rosie and Alex are the best of friends throughout childhood, but as luck would have it, in high school, Alex moves from Dublin to Boston for his father's work. They remain in touch via correspondence, and although it's apparent to the reader that Rosie and Alex care more for each other than just friends would, they can't quite seem to communicate this to each other. More years pass than I was expecting and the whole time you just want to reach through the pages and give them each a shake. This book is about destiny and fate, but after so many missed connections, sometimes you have to make your own destiny. I haven't seen the film version for this yet, but I'm really looking forward to it! From the trailer, it looks to me like they condensed the time frame, making it much more believable. Also, Sam Clafin is in it, so how can you NOT watch it?! MY YEAR OF RUNNING DANGEROUSLY by Tom Foreman: I listened to this one on audio (narrated by the author), and it was a quick and easy book to listen to. Foreman, while no stranger to running, has put the sport on hold for much of his adult life as his career and family life were more important to him. When one of his daughter's asks him to train for a marathon with her, Foreman agrees. What he doesn't realize when he signs up for this task, is that this one marathon will turn into several more, including many half-marathons, an ultra-marathon (55 miles), and 2,000 miles of training runs. His story is crazy and inspiring and I really liked how he acknowledged that while running is essentially a solo-sport, he couldn't have done what he did without the support and love from his family. Full of a lot of great quotes, I think even non-runners would enjoy this book. 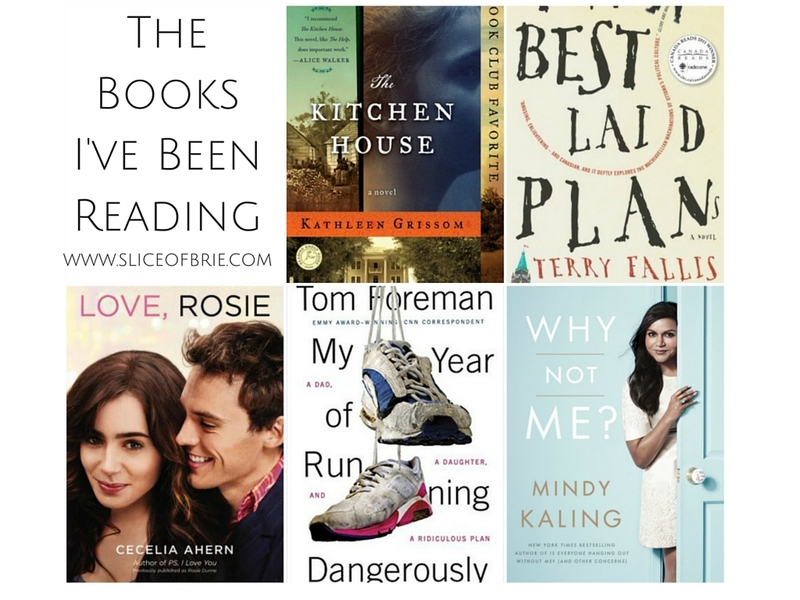 Best and worst book you've read lately? Are you a fan of Mindy and her books? Are you one of those lucky people who can read in the car? 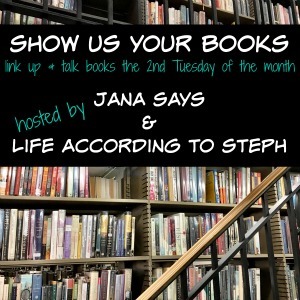 Linking up with Jana and Steph for SHOW US YOUR BOOKS! 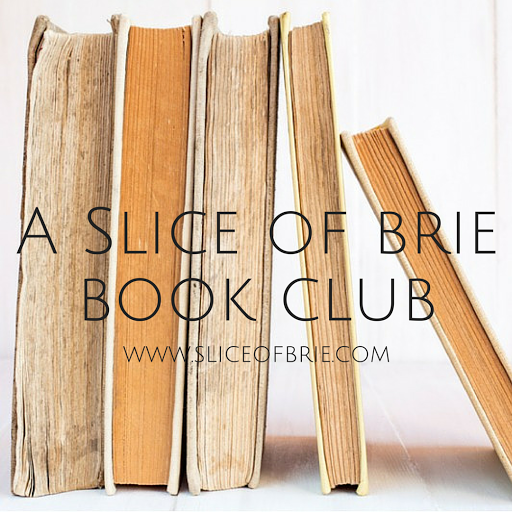 A Slice of Brie Book Club: May's Pick! Weekending: A Quick Trip to Edmonton!